This week I built small single coil guitar pickup to demonstrate the way they work by induction. This was a really fun project because I ended up also building a simple one string guitar! There’s a lot of info on the internet about building your own pickups. This one is very easy to build with common parts. All that you need is a magnet and some magnet wire! 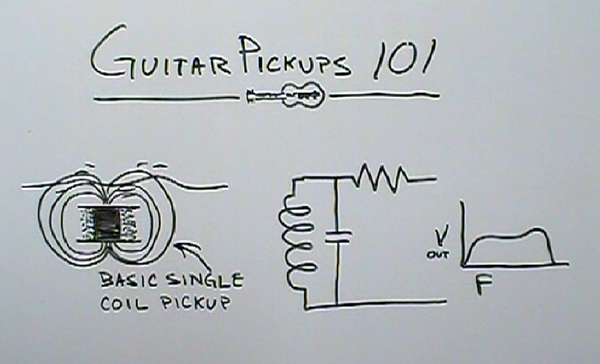 A guitar pickup is a simple inductor. At it’s center is a magnet and around it are windings of copper “magnet wire”. Magnet wire is simply copper wire with an enamel coating which serves as an insulator. The pickup is mounted under the steel guitar string so that when the string vibrates, it alters the magnetic flux thus creating a voltage. A pickup is essentially a generator or dynamo. A generator is defined as “The production of an electrical potential difference (or voltage) across a conductor situated in a changing magnetic flux”. The copper wire serves as the conductor with the change in flux generated by the wire vibrating in proximity to the coil. A pickup has an inductance measured in “Henries”. One henry is the amount of inductance that is required to generate one volt of induced voltage when the current is changing at the rate of one ampere per second. Two other characteristics of a pickups are a resistance measured in ohms and a “distributed” capacitance which is in parallel with the inductance of the coil. The combination of these three factors – an electrical circuit comprising an inductor and a capacitor connected in parallel, with a resistor in series – is effectively a tuned circuit with a well defined resonant frequency. Most pickups exhibit a peak frequency between 2K and 8K depending on the type. These are really fun to build so I encourage you to give it a go and experiment! Could this be done without destroying the speaker? How about just removing the sound cone and leaving the coil in place? That might work, but it would be difficult to remove the cone without destroying the coil, and the coil has very few windings so the output would be very minimal. I’m really enjoying your posts. Just subscribed my reader to hackaweek so I don’t have to rely on reposts to catch them all. I misplaced my awesome button so, awesome work man. Keep it up. To make a pickup for a bass would you need to do more windings/use a larger magnet to get the low frequency response? Do you have any idea what value of inductance your pickup has? I have become a big fan of yours! An easy question: what kind of production setup do you have for your videos? They are some of the best quality on the web! Specifically, what kind of camera(s) do you use? Do you use an external mic? Also, what kind of lighting do you use in the hack shack? I use a JVC Everio model GZ-MS1108U. I edit the videos in Video Pad Editor free version and save the movie as an AVi. The camera has it’s own mic which does quite well. The lighting is florescent.